Structure of the Atom Class 9 Notes are prepared by our panel of highly experienced teachers according to the latest NCERT Syllabus. These notes provide the students with the summary of the chapter, important points to remember and detailed explanation of important concepts and derivations for better understanding. 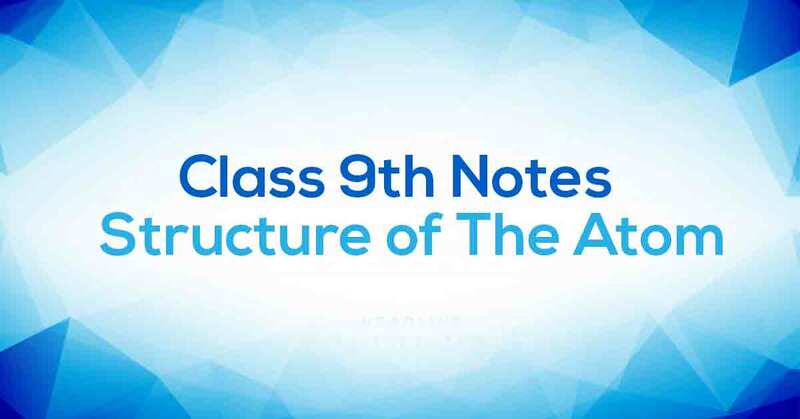 Structure of The Atom Class 9 Notes aims at easing out your learning and revision process. Understanding Structure of The Atom. Atoms are made up of three types of tiny particles. Protons (or positively charged particles) and neutrons (or particles that contain no charge) are found in the nucleus of an atom. Electrons (or negatively charged particles) are found outside the nucleus. There were many structures of atoms provided by scientists. Learn more about it in Structure of the Atom Class 9 Notes pdf.